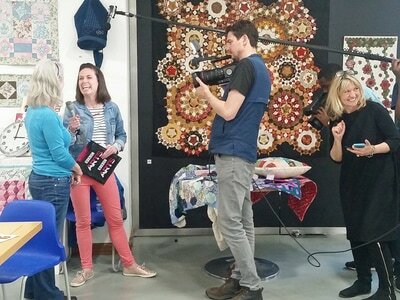 ​London Quilters took part in the nation-wide Arts Get Creative weekend and on the day a large crew from the BBC arrived at Swiss Cottage Library to set up for a live stream featuring members of London Quilters/The Quilters’ Guild. 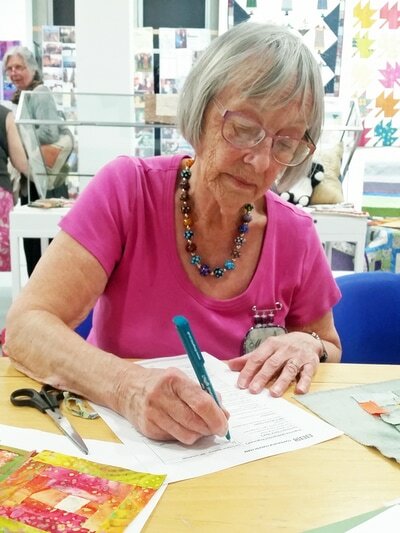 The gallery space had been rearranged to accommodate a long table at which LQ members could be seen stitching away at a ‘quilting masterclass’. 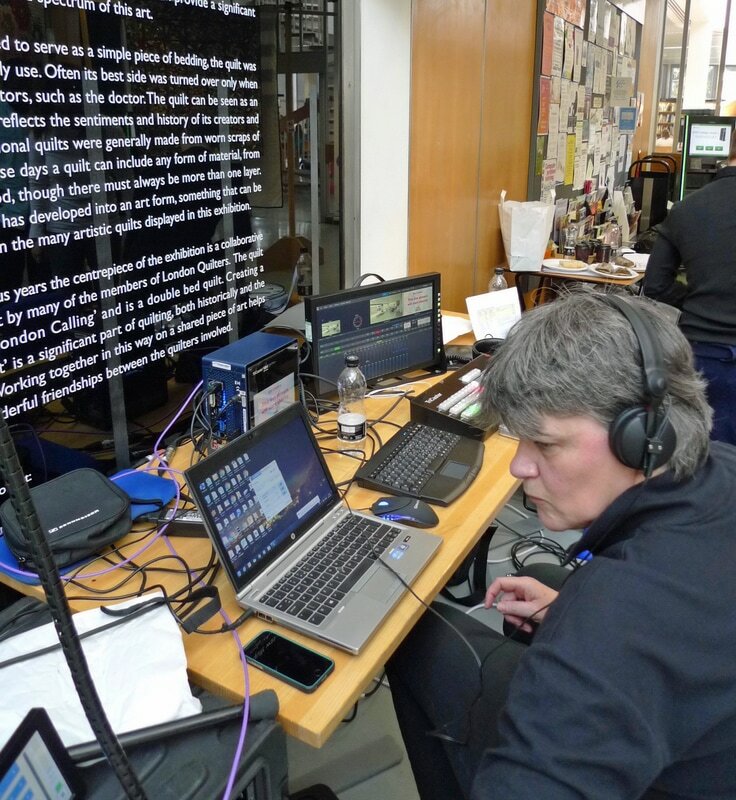 In the atrium, BBC technicians and production staff hovered around the mixing desk, laptops and a tangle of cables connected to lightweight cameras to make last minute technical checks. 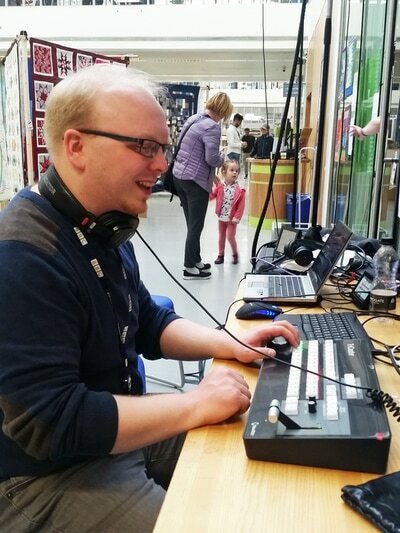 Production Technology Manager Susan Allman explained how the streamed footage would be relayed up to BBC Glasgow then sent back down to the Library before being transmitted live on BBC’s Get Creative’s website – for those technical minded folk – involving a few seconds of delay before hitting the airwaves. A countdown from 10 galvanised everyone to their positions, adding a frisson of nerves to the occasion. Presenter Lindsey Chapman (BBC2 Springwatch Unsprung ) kicked off proceedings introducing the Exhibition as one of many events taking place as part of the BBC’s Arts Get Creative weekend. Presenter and crew then swung into action – talking first to Marion McCrindle about The Quilter’s Guild, some of the different stitches used in quilting and looking at her sample quilts. Then onto our chairman Maggie Paykel in front of the raffle quilt ‘London Calling’, closely followed by Sarah Hibbert and her quilt ‘Taleisin Leaves’. 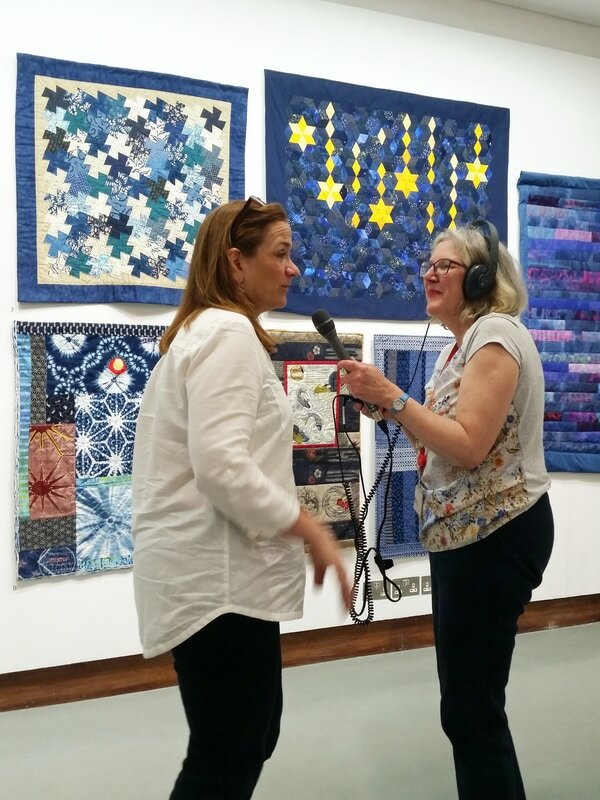 Next up Christina Saunders explained how a Friday evening event at the V&A led her to making her ‘Meadow Flowers’ quilt, five years later. Chapman rounded off the broadcast interviewing Tracy Chevalier about her quilt ‘Mrs Reed’s Quilt’, the therapeutic qualities of quilting and the benefits of being part of a quilting community. 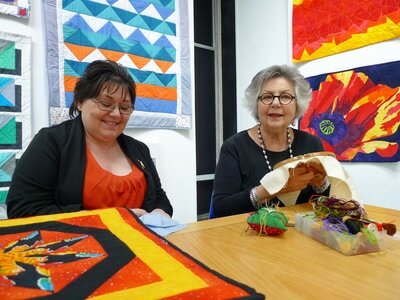 For Tracy quilting is ‘a great antidote to our crazy modern life’. 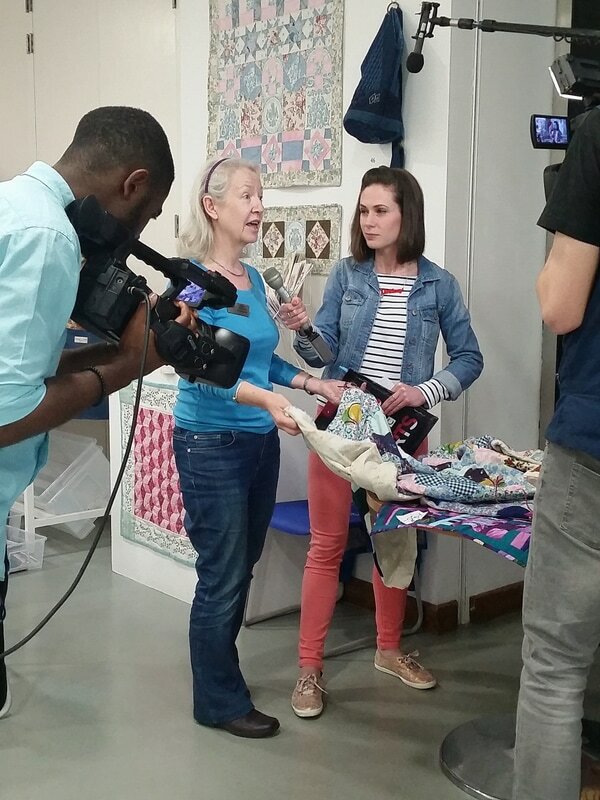 With my own television background, I found the technical side of the operation interesting. What would have been a much larger team doing a full blown Outside Broadcast – was now transformed into a portable mixing desk or two hooked up to a laptop streaming straight onto the internet, producing half an hour of good quality footage. The piece certainly had a live feel to it along with some ‘realtime’ questions which came in via the hashtag #getcreative by phone. 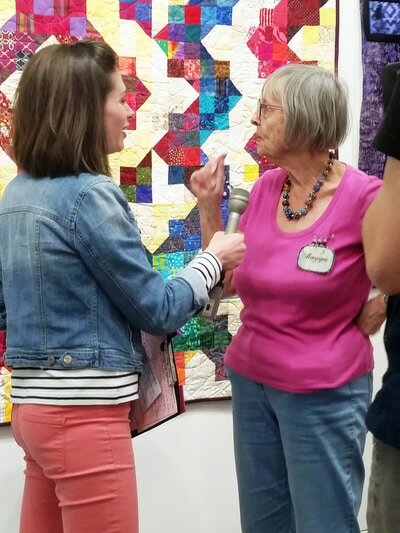 Lindsey Chapman did a great job bringing quilting to a largely uninformed audience with genuine enthusiasm and interest, not to mention her plug for the final week of our exhibition. All those members interviewed were articulate and excellent on camera. To date the broadcast has been watched on @BBCArtsonline’s Facebook page by 9,876 people…. which is, in my books, pretty darn good.